Hello. I know some of you are highly proficient when it comes to the technical aspects of lighting, and some of you render on very powerful hardware. Just a warning, this probably isnt for you! If however, you are rendering on lower end hardware, or are finding it hard to render interiors without lots of grain, this IS for you! Window lit rooms are a tricky beast due to the fundamentals of pathtracing. It relies on a lot of GI bouncing through refractive glass, which is a computational nightmare. You could start tearing down walls, hiding meshlights out of shot, use light portals or even hidden photometrics. All of these methods have pros and cons, but the best solution i've come across are ghost lights. Ghost lights are invisible mesh lights that can be placed near a source of light to boost the amount of light being emitted directly into the scene. They are invisible, they do not effect reflections, and since they can be done with single poly planes, they are incredibly cheap to render. Here is a before and after, using a single Titan x (This is useful for much lower end hardware). This is a completely enclosed room, no cheating! Do not play around with anything other than the Luminance and emission temperature unless you know what you are doing. You can however set "Two Sided Light" to *off*, but you must make sure the plane is aiming in the right direction before hand. I'm going to keep this short and sweet because i'm disastrously busy today. Please let me know if this helps any of you, and if you find it hard to follow, let me know so i can update this tutorial. I'll try and update it soon with some other tricks and cheats you can take advantage of. Until then, happy rendering! very cool tutorial. Thanks for the tip. Very interesting. Is there a reason for setting the emissive panes to two sided? Wow, nice, thanks for the great idea. Nope, one sided is fine. This was aimed at beginners though, and i had a horrible feeling that they might place them the wrong way round and then shout at me because nothing was happening. I was going to mention something about that yesterday, then realized there's a lot less playing around with it if you don't have figure out which side the light is coming from. If the plane is pointing the right way, it's a simple matter to just flip Two Sided to OFF. That may shave a couple more seconds/per light off the render time. Mjc, i was wondering when you were going to pop up and tell me why i'm completely wrong, but you didnt, so good times! I'll update the tutorial later with a note about two sided lights. I would so do this. Not shout at you but turn it round and wonder what the heck I was doing wrong lol. Sweet! Thanks for the tutorial. Much appreciated. Nah...nothing wrong with this technique. Even leaving two sided on makes sense, in this case. It will work in 3Delight, too. For clarity sake, which one do you add for 3Delight? UberAreaLightbase? Looking in the Files/Lights/other I see items like Light Plane, Light Sphere, Light Tube, UberAreaLightDisk, UberAreaLightPlane etc. Would any of those be applicable for situations like this? I rearely hear anyone mention those. Here is one with UberAreaLight Base applied to a plane, sized and placed over the window of the door. Opacity is set to 0.001%. Just a quick note: I'm using 4.9 on a 2007 Lenovo T61, Core2-Duo, Invidia 140m onboard "graphics", and 2 gb accesible ram, with an SSD system drive and an outboard HDD data drive. I finally found a way to do a non-crashing Iray render, by setting a system-managed paging file on my outboard USB 2 HDD. The paging file has to go on the outboard, because paging is contraindicated for SSD's, so it does have to squeeze through that USB 2 bottleneck. This, I think, qualifies as "lower end hardware." I have struggled to get predictable interior light in a scene like KA is showing above, and have been wishing for an Iray option something like AoA's Ambient lighting, which I use in most 3DL renders. I've purchased a couple of Iray interior lighting sets, but they seem more suited to portraiture, and do great job at that, but I want the lighting freedom I'm used to in 3DL. I took KA's Ghost light tip, here, and was shocked at how well it works, and what subtle effects are possible, especially by using different colors on several ghost lights, like a blue coming in the windows on the shadow side of the room, and a golden light coming from sun-side windows. To do that deliberately, without trying to guess at what a given HDR is going to come up with and rotating ad nauseum, is a tremendous restoration of my artistic exhiliration. Just huge fun. The renders still take "a bit" more than 2 minutes, but what I get for waiting is so much richer and more fun than trying yet-another HDR and hoping it looks "kinda" like I "wish" it would. A couple of hours of experimenting with ghost lighting showed me I can do whatever and exactly what I want, even given the hardware constraints. Struggling about which side emits, I found that using a glaring color and blasting the luminence makes that easy to find out, and then rotate the primitive and switch to more nuanced colors and luminence. Experimenting with that "which side" process was such a trip, because it showed me I can do anything, exactly as I want to, and still have a lot of room for physically-based-light magics to happen in the mixing and bouncing of light interactions and reflective surfaces. So far, a simple-scene fifteen minute render is still quite grainy, and a one hour render needs more time, but a five minute tweak render shows enough to see how the lights are working and where the render is going, and stop to adjust ghost light angles and colors. To be realistic, I don't know how long it would take to get a smooth looking render like I see above, probably a few hours, if even then, but I do have confidence now that however long it takes, it will be the render I wanted. So, a big thank you to Kindred Arts. I am going to get KA's Ghost Lighting set, for ease of use, and in support of KA's contribution to my art efforts, but a little experimenting with the concept and settings laid out above proved how worthwhile this investment wll be, come payday. No problem, and thank you for such a thorough review. I know a lot of hobby artists work with incredibly tight budgets, and i felt quite guilty about hoarding such valuable information. I can't take credit for it though, this method has been around for a very long time, spanning several different renderers, i just tried to make it more accessible. My set on the store is designed to take a lot of the guess-work out of it, and includes a lot of physically accurate lighting presets. If anyone can't/doesn't want to purchase my set however, i'm still here to support anyone who has issues with this method. Glad to be of service, happy rendering! I'd personally recommend AGAINST leaving it two-sided on......if there is glass behind it, and it has a realistic glass shader and thickness, the engine WILL calculate the light interactions through the glass, which will be slower. Of course, with recessed windows like this, you might get unwanted darkening of everything behind the one-sided lighting. I started with Daz end of August this year and I just got the Ghost Light Kit 2 now after someone recommended it. I am not sure if I am using the Kit in the best way, but I find it already very satisfying. I just use several light balls at around 50% scale and then adjust exposure value and intensity preset (kcd) to get enough light and I put light preset at 9000K which seems to give the most natural color(?). Before using Ghost Light Kit, I spent quite a bit more time on indoor lighting using spot lights, so I am happy I got this now. Hey Dirk! Glad you like the set. 9000K is a light blue color. Lower kelvin units denote an orange/red color, whereas a higher value turns blue (6500 is neutral). Hope that helps. The first time when I used the light balls without any materials, the color became a bit yellowish. I attach some files below. The first render I made for this was with only light from the environment through the windows and to obtain a similar color with ghost lights, I had to apply 9000 K. Since then I always apply 9000 K.
Yup, a higher value will work for skylighting (especially overcast light), and lower values for sunrise/sunset. i had mentioned in another thread that linked to this tutorial for the Ghost Light 1 pack which I love and use a lot. However, I also own the Ghost Light 2 and the Light Probe packs. I'm not sure how to use the balls and 'lamp shades' in Ghost Light 2, and the presets in the Probe pack are super confusing to me. So many presets that I'm confused about which one to use, which balls to turn off (or if I should turn any off), and how do I light just an average area in an average sized room like the inside of a lot of the products here that are small apartments, bedrooms, living areas, etc, Also like the inside of an area like a spaceship. I own so many Petipet items, and they're all tight spaces...short hallways, small rooms, small bridge, etc. Other products I have are also like an inside of an abandoned warehouse, a basement and so on, The presets seem so large for the areas I want to cover. Sorry to be a pain, but it's a lot for me to figure out on these 2 sets. 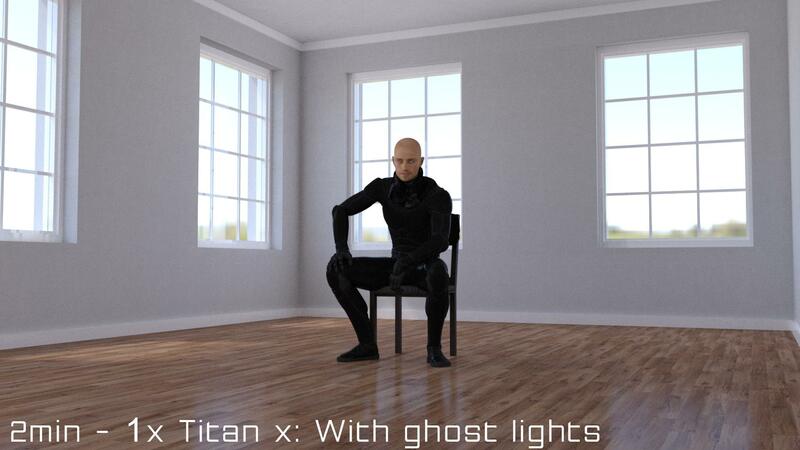 Iray Ghost Light Kit: This is the original kit with simple planes that emit diffuse illumination. They are soft, invisible area lights that emit only diffuse light, no spec or gloss. 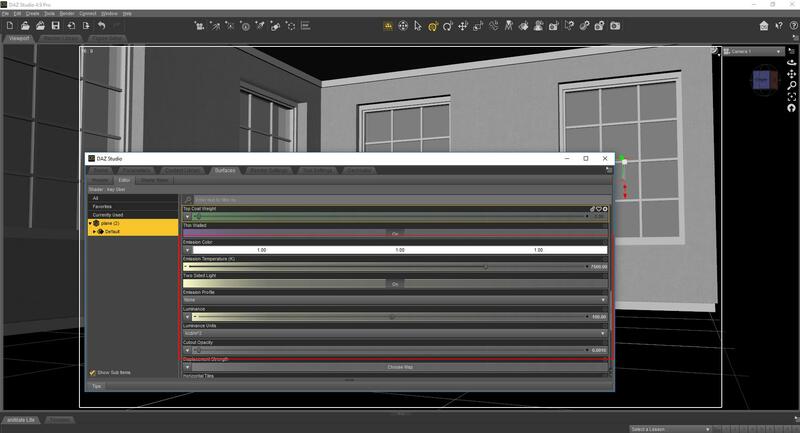 Iray Ghost light kit 2: This kit is similar to the first one, however there are now an extended range of primitive meshes and a range of ghost lights with parented props. These props are useful if you would like a specular source, but don't want to add more lights yourself. That was the main focus of this set - Better gloss, and more content. Iray Light Probe kit: This is specifically for large areas. Each probe (ball) emits diffuse light like the first set. Unlike the first set however, this network of probes can be spread of a large area to produce low-level ambient light. If you remember the ambient light from the old 3DL days, that's what i was trying to replicate. That's a short break down of what the sets are. So, for example, you mentioned lighting a simple room yes? 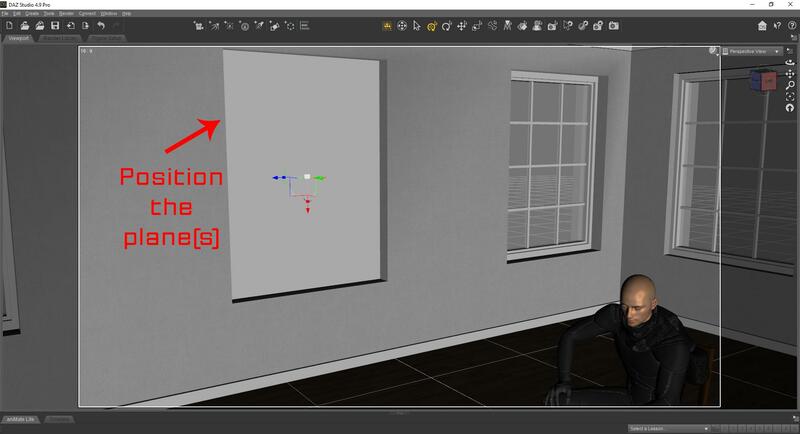 If you wanted the room lit by natural daylight, i would use the standard HDRI (or any HDRI) and place ghost lights in front of the windows (Making sure you apply the setup material so they work properly). Then you can vary intensity and color to get the 'look' you want. If you wanted to light the same room as a night scene, you could tackle it from a different angle. You could use some of the props from IGLK2 to emit light and mimic lamps/ceiling lights. Simply place some of the props provided around your scene and use the ghost light setup material once again. If your room just so happened to be huge, that's where the light probes can help. You can spread a network of probes around the area and use the setup material once more, along with any other presets to achieve the look you want. This will reduce render times by casting direct light onto surfaces instead of having the renderer rely on bounced light. I made a video here on how i normally use ghost lights too. I hope some of this has been helpful to you, if you're still stuck please let me know. Again it's a bit of a complex topic and there is no 'right' answer to anything, i just pass on the tools and knowledge that i find helpful. If you have a specific look you're trying to achieve, and can probably guide you. Sapat, with the Iray Light Probe Kit you describe, you can use the presets to move the lights, or you can move (or scale) each individual ball (ie: light) wherever you need it, even clumping them together. With Ghost Light Kit 2, I mostly use the light ball and position it where I need, then I use the 'Apply the before preset', etc. I've not needed the other shapes, though I do use the included prop lights occasionally. All combined with other kinds of lights (spotlights and point lights). I even use ghost lights in outdoor scenes to lighten overdark shadows, etc. The Ghost Light 1 - is what I primarily use for most things. I love it. Ghost Light 2 - I wasn't connecting with the fact that they will produce better specular and gloss. Is that just for the balls (probes) or does it include those ones that look like a ball that's been cut in half (I call them lampshades). Not really sure if those are just for ceiling lights, or lamp lights, or walll sconces. Light probe kit then sounds like it's something I can use in those spaces I have like basements, warehouses, etc. Didn't know that it was for large areas. Good to know. I did watch the video, thanks, Even thought it was short, it gives you a lot of insight. Perhaps one day you can make videos for GL2 and LP. I hope I can catch on and hope I can come back if I have a question. Dragonfly, thanks for the additional info. I guess I'm not aware what 'prop' lights are in GL2. Guess I'll have to look again. Sapat, by 'prop lights' I meant the ceiling lights, handheld lights and lamps.